How Good Is a Wine List’s Least Expensive Bottle? 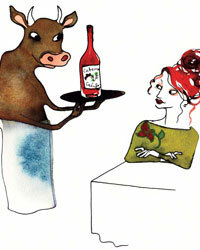 F&W’s Lettie Teague orders a few rock-bottom choices—and discovers some odd and some excellent wines. I try to observe proper restaurant protocol. 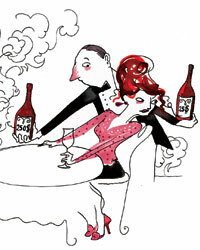 I always wait to be seated; I never arrive barefoot; and I never, ever order the cheapest bottle on the wine list. And yet, in regard to that last item, I’m not really sure why. Perhaps it’s because of the universal perception that the only people who order from the very bottom of the list are cheapskates or people who don’t care what they’re drinking. But, I recently wondered, is that really true? In these less-than-flush times, might not wine directors be paying as much attention to the bottom of their lists as the top? After all, any wine professional can find great pricey bottles, but it takes a truly talented one to ferret out a great deal. I decided to take a tour of the low end of some very good wine lists, but first, I talked with the professionals who created them. I began with Joe Bastianich, the managing partner of 16 restaurants in New York, Los Angeles and Las Vegas, 12 of which he co-owns with chef Mario Batali. (Joe is also a vintner in Italy.) The Batali-Bastianich food empire ranges from elaborate places (Manhattan’s Del Posto) to casual ones (Casa Mono and Lupa, also in Manhattan). When I called Joe, he was in his car, traveling between his various restaurants. I asked him if he had a price in mind for his cheapest wine(s). “Twenty-eight dollars,” he replied definitively. “I’d never go below $28.” How had he arrived at that number? “It just feels right,” he said. In fact, a review of his Manhattan lists revealed wines well below that amount: Becco featured several very inexpensive reds and whites, including a nice Dolcetto and an attractive Aglianico for $25 each, while Lupa had two whites and a red for just $21. Had these prices “felt right” to Joe at some other time? At Charlie Trotter’s in Chicago, the cheapest bottle I found was a $21 red from Missouri: the 2001 Mount Pleasant Norton. Created in the 19th century by a Virginia doctor, Norton is a hybrid red grape—an oddity on any wine list and definitely an anomaly at Trotter’s, which sells lots of three- and four-figure Burgundies and Bordeaux. I called Mount Pleasant’s president, Chuck Dressel, and asked if he knew that his wine had such a fiscal distinction. “It’s an honor to be on the Charlie Trotter’s list,” said Dressel. Even if the wine is at the very bottom? “It’s great to be on the list at all,” he gamely replied. How had the people at Trotter’s learned about this wine in the first place? Dressel recounted a phone call from the restaurant’s wine director, who’d read a good review of Mount Pleasant in a trade publication. The wine director had ordered a case—four or five years ago. “At $21, that wine is a really good buy,” said Dressel. “The current vintage  costs $35 retail.” Dressel subsequently sent me a bottle of the 2001, which I thought was still quite appealing, with notes of cherry and spice and a lively acidity. To get a better sense of these options, I decided to try a cheapest-wine-on-the-list experiment on a two-day trip to Washington, DC. What better place, I reasoned, to practice an act of economy than in the city where key decisions about our collective fiscal health will be made? I chose two types of restaurants: Proof, a fancy place in the Penn Quarter, and Cork Wine Bar, a casual, newish spot just off Dupont Circle. When I announced my wine mission to my DC dining partner, he sighed. Did we really have to order the absolute cheapest bottle on the list? he asked. Couldn’t it be the second-cheapest, or even the third? “I mean, a wine that costs $20 on a list probably only goes for $6 or $7 in a store,” he said. “That’s just a headache in a glass.” But he cheered up considerably when we entered the well-appointed, clubby dining room of Proof. He became even more cheerful when he saw the menu, which included a substantial selection of steak. (The grilled hanger steak with mushrooms and potatoes in a jalapeño vinaigrette was particularly good.) “I could eat here every night,” he declared. I turned to the wine list. There were lots of impressive names spread over its 60-plus pages, with an especially deep selection of cult Napa Valley Cabernets (Screaming Eagle, Bryant Family, et. al.) and collectible Bordeaux (such as the 1947 Cheval Blanc). But I wasn’t really looking at names this time, only numbers. I’d never read a wine list quite this way before; it was like reading a book for the punctuation rather than the prose. I scanned the wine list until I hit fiscal rock bottom: an Australian white wine, the 2007 Marquis Philips Holly’s Blend, for $21. An easy-drinking blend based on the Portuguese grape Verdelho, the Marquis Philips is a popular wine that’s readily available in stores, where it generally costs about $10 a bottle. It seemed to be an exception to the rule that high-end restaurants will turn to esoteric wines for the very bottom of their lists. In fact, wine director Sebastian Zutant did have another wine on his list that was nearly as cheap as the Holly’s Blend, and much more exotic: the 2002 Barberani Grechetto, from the Italian region of Umbria ($24). But Zutant had a hard time getting people to order this wine, because, he said, most people don’t know what Grechetto is. Plus, “the wine is kind of oxidized,” he added. Zutant gave my friend and me a glass of the Barberani to share. He was right: It was an odd wine—definitely not something that would appeal to a broad audience—though it did have an unexpected richness and depth. Still in search of the Cheapest Wine Universal Truth, my companion and I next made our way to the crowded Cork Wine Bar. The menu was a casual selection of tapas-style small plates (the house-cured trout with fennel and toasted hazelnuts was terrific), and the wine list offered half a dozen choices for less than $30 a bottle. The cheapest, the 2006 Château du Bloy Sauvignon Blanc from Montravel, France, cost $26. 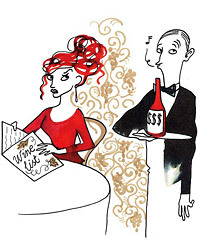 (Most of the least expensive bottles on the wine lists that I looked at were whites.) The Château du Bloy was crisp, with zesty citrus notes: an excellent value. When I asked Cork’s co-owner and wine buyer, Diane Gross, about the du Bloy, she explained that she had chosen not only well-priced wines but wines that she personally liked. That seemed like a good practice overall; why should one’s passion have a monetary minimum? Besides, as Jonathan Pullis and Andrew Green had pointed out, there are lots of wines from all over the world that happen to be both interesting and cheap. Although I was a little embarrassed about ordering the cheapest bottle on the list, I kept buying my wines that way when I came back to New York. And the results were as mixed as they had been in DC. In restaurants where wine directors had considered the cheapest wines as carefully as they had their trophies, the experience turned out to be true vinous pleasure—and otherwise, well, I consoled myself with the fact that I was paying a much smaller check. Are the Wine Lists at Steak Houses Any Good?